Outlaw Bikers began to gain attention right after World War II when many servicemen came home. Many loved to drink, get rowdy, and have fun. A Biker run-in with the law in Hollister, CA, in 1947 made national headlines. Hollywood movies like "The Wild Bunch" in 1954 and "Easy Rider" in 1969 gave the Biker lifestyle more exposure to the general public. The "Pissed Off Bastards of Bloomington" in the late 1940’s led to the formation of the Hells Angels. Soon, other Biker groups like Bandidos, Outlaws, Pagans, Sons of Silence, Mongols, and Vagos also gained national attention. 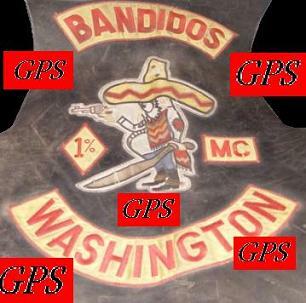 Outlaw Bikers have been active in Washington State since at least the late 1950s. 99% of the people who ride Bikes just love Harleys or Hondas or whatever, and then there are the 1%'ers or the Outlaw Bikers. Most Outlaw Bikers will have vest "colors" as a 3-piece patch: their club name on the top rocker, their mascot or logo in the middle, and their chapter on the bottom rocker. While they call themselves clubs, law enforcement has deemed them "Outlaw Motorcycle Gangs", or more accurately "Organized Crime".